Introduction: For anyone that wants to know my background in martial arts (as usual, this will be a little long-winded…), I started off with a year of fencing at Yarm School. Up to that point, I had never been especially interested in sports, mainly because I was crap at them all. Fencing appealed to me largely because I’m a geek: I saw it as a way of connecting with the fantasy books I read avidly (and still do) throughout my youth. The same impulse would lead me, somewhat bizarrely, to a brief stint at horse riding in another school. I think I started fencing lessons around 1993/1994, but not completely certain - I do remember it was just before I moved down South. Unfortunately, I wasn't able to keep up the fencing at my new school, so had to wait until 1999 to get back into martial arts. In September of that year, I began my English Lit BA at the University of Warwick, having spent the previous summer getting excited about what martial art I could try out (I got some kind of "intro pack" through the post, which listed the various sports on offer). At this point, I knew almost nothing about martial arts beyond what I'd seen in films, but decided that I wanted to try kung fu, due to my enjoyment of the related cinematic genre. In my corridor in the first year, there was a guy by the name of John Booth who had some kickboxing experience (along with muay thai, I think: whatever it was, seemed to have kept him in good shape, so I assume it was probably one of the heavier contact martial arts). In the run-up to the Sports Fair (held near the start of the year annually, where all the sports clubs have a stall and try to recruit new members), I asked his advice on what martial art to take. John suggested kung fu - at that time, the only club advertising itself as 'kung fu' was a little known MA called Zhuan Shu Kuan. In short, it could be described as kickboxing with traditional trimmings (stances, forms etc). That's reflected in a name change that was brought in some time after I left university, from Zhuan Shu Kuan to ZSK Chinese Kickboxing. I duly signed up with a friend from my halls. She soon lost interest, but I kept up my training three times a week pretty much throughout the whole of first year. I was also keen to grade, an ambition delayed after Glen Cudjoe (the main instructor) quite reasonably thought I wasn't displaying sufficient effort when demonstrating the first ZSK form. That would be a recurring problem (I'd eventually lose any interest in the traditional side of Zhuan Shu Kuan), but I was suitably improved to go for my first grading at the next opportunity, receiving a a blue tag. In the university holidays between the end of second year and the start of the third, I had a look at what martial arts were on offer near my home. It turned out that the leisure centre next to my school in Chesham had a kickboxing class, which IIRC was called ‘Pegasus Kickboxing’, run by a trim, grey-haired instructor named Mike. I can’t quite remember how many sessions I attended, but I’d guess around four, each of which were two hours long. Mike was keen on fitness, so there was a long warm-up, followed by hitting pads and later some sparring (to my surprise I found myself paired up with a girl from school I hadn’t seen in years). Not a bad place to train, so if it's still going, worth a try if you live around the Chesham area. I'm assuming Pegasus sends out competitors regularly, as there were a number of buff looking people in kickboxing trousers training away from the rest of class. The start of the third year meant that I could have another wander round the Sports Fair, and perhaps try out some additional martial arts on top of Zhuan Shu Kuan (or ZSK Chinese Kickboxing, if you prefer). Over the course of my BA, I had a go at capoeira, samurai jiu jitsu (currently operating under the name of Jitsu. See this thread for more on that organisation), aikido, wing tsun and escrima. I think all of those were in my third year, but some might have been in the second. Either way, I wasn’t too keen on any of them, so continued to just train in ZSK. By 2002, I was into the last months of my BA degree. I’d learned the lessons from second year, so worked much harder this time round. However, my Zhuan Shu Kuan training still suffered in third year – I think that must have been due to the BUNAC working holiday to Banff, Canada during the Summer, where I followed my girlfriend (who I had first met in a Zhuan Shu Kuan class at the end of 2000). The scheme started before the end of term, meaning my training was cut short. My marks for the BA were good enough for me to apply for a Masters degree later the same year, again at Warwick. I had no wish to leave university just yet, as my gf was still there another year, and I also wanted to continue training in Zhuan Shu Kuan/ZSK Chinese Kickboxing: I’d made a number of friendships through the club over the preceding three years, making ZSK a major part of my social life. So, I returned to Warwick after Canada, renewed enthusiasm meaning that once again I was attending every session of ZSK I could make (although in the third term, I injured my ankle, which again cut my training short that academic year). It was at this time (specifically the 26th October 2002, according to my Tung-Fu join date) that I got into the geeky world of internet forums, which in turn sparked an interest in MMA, and by extension, grappling. I wasn’t ready for MMA yet, but on the advice of somebody from a forum, I decided to try and organise some groundwork sessions with a judo black belt friend of mine I knew from Zhuan Shu Kuan. We booked the activities room four or five times, where Mike ran me through some of the basic positions and a few submissions (I wish I'd taken notes, but I didn't get into that habit until a couple of years later). Towards the end of my Masters degree I had another opportunity to try the ground. One of the forums I posted at had a meeting in nearby Warwick (the University of Warwick, rather strangely, is actually located in Coventry. As ‘Coventry University’ already existed, the founders decided that Warwick would work as a name – the fact it sounded a lot posher no doubt helped), where I arrived late for the self-defence session with Dave Turton. 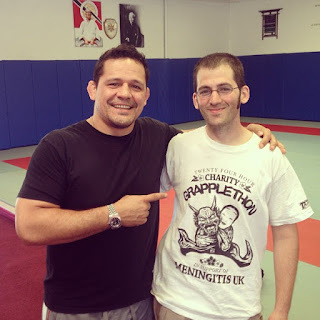 He was followed by Andy Davis, an MMA instructor, but when it came to rolling, I wimped out of a fellow forum goer’s request to spar (something I was able to rectify three years later, when I met him again at the Midlands Throwdown). In Bristol, I had the opportunity to again try out some other martial arts clubs. First of all my gf and I popped down to a taekwondo class - a martial art which had taken a serious bashing in all the forums I frequented - in Kingswood, and it proved to pretty much fit what I’d read on the net (though I found it fairly enjoyable up until the ‘street style’ section: nice people). Next up was the excellent wushu club run by Neil Genge, which I tried purely for acrobatics – attending about five classes, I was thrilled to finally manage a somersault and kip-up, although admittedly the sprung floor kinda helped. The last club I tried before setting off for Hong Kong was Kevin O’Hagan’s MMA class, which also marks the first time I started logging my training. Hence why it’s the first training log entry in this blog. Between 2004 and 2005, I popped along to a few more MMA classes, mainly in London, along with a few other MA, like hapkido and kickboxing. I also made it back to Warwick a few times to train at ZSK Chinese Kickboxing, but very intermittent. In February 2005, I took on some major writing commitments at Warwick Uni, so decided to not only make my Zhuan Shu Kuan training more regular, but also get into Judo and something going by the name of 'Kempo Ju Jitsu'. Annoyingly, I got injured early on, which put me out of full training for almost a year (although after a few months I was able to train around the injury at ZSK). On the 18th March 2005 (judging by this thread), I started logging my training by the hour, which fit perfectly into my growing love of data (heightened by the job I was doing at KPMG back then, an analytical career path I stumbled into but have somehow continued, moving from corporate to educational, then the charity sector). That involved some guesswork and estimation for my martial arts experience pre-2005, but has proved a useful tool in the years since. I have an old Bullshido thread to thank for what has become a huge spreadsheet. Also worth mentioning that I headed down to a number of throwdowns from 2005 (the first one being that Tung-Fu meet in 2003) until around 2008, mainly due to the Bullshido website. These events were a chance to train and spar with a whole bunch of people from different backgrounds, not to mention a great opportunity to put faces to names on internet forums. Looking back, that process of getting lots of like-minded martial artists together acted as a sort of precursor for what I developed with GrappleThons much later. 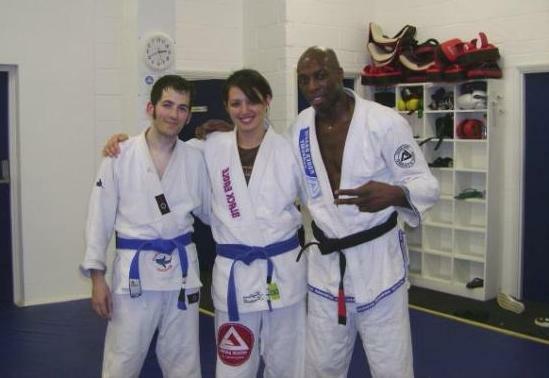 Once I recovered from the shoulder injury in 2006, I endeavoured to finally join up at a BJJ club - my first option was the Gracie Barra gym in Birmingham, but their beginner classes were at times I couldn't make. So, that left the Roger Gracie Academy in London, where I began in November 2006 (unless you count the intro in October, which coincidentally took place exactly four years after I first started posting in online martial arts forums), having watched a class the week before. Reading on the internet, especially at Bullshido, provided an excellent set of principles that would serve me well as I started BJJ. This thread in particular has become something of a touchstone, and I'd urge anyone interested in training martial arts to give it a read. I trained as regularly as I could in those first few months, in order to get my third stripe and move on to the advanced class (due to the greater choice of classes that would entail, as third and fourth stripes can train in both the beginners and advanced). Normally I managed two or three classes a week, which was all my convoluted travel schedule would allow. Getting that third stripe in June 2007 was probably the impetus for concentrating fully on BJJ, as it considerably expanded the amount of classes I could attend. Before that, I had intermittently gone back to my old ZSK Chinese Kickboxing class (I think it had made the formal name change from Zhuan Shu Kuan to ZSK Chinese Kicboxing by this point), but since the promotion and an increase in workload outside of class, I was 100% focused on grappling. My last session of Zhuan Shu Kuan was April 2007. My first BJJ competition took place August 2007: first fight, first loss, though amusingly I still got a bronze, because the guy who beat me went on to win the division (there were only four of us competing at super featherweight). Shortly after that, I popped over to the Belfast Throwdown: video below is me rolling with Waqi. At the time, he was a very experienced blue belt, who could easily have smashed me, but mercifully went light. The 14th January 2008 kicked off what would become a major part of my blog, the reviews section. My first was simply a result of being frustrated and ill, so as I couldn't train, I decided to write-up my thoughts on what I'd been reading, Angry White Pyjamas. A month later, on the 14th February 2008 (they accidentally put January on the certificate, but meh, close enough), I got my blue belt from Jude Samuel, who was then a black belt instructor at RGA. I was especially pleased to get the belt from Jude, as at that time he was the only black belt to have rolled with me, and also the person who had taught the majority of the classes I'd attended. So, out of the people capable of promoting me, he was definitely best placed to judge my current level. That meant I had accomplished one of the goals of this blog, which is to track somebody's progress from white to blue. I've noted each grading along the way, and this spreadsheet goes into exact detail on how many classes, hours etc (if, like me, you're geeky enough to care about that sort of thing). Of course, what qualifies a person for a blue belt is a subjective decision by a particular instructor, and therefore varies from academy to academy. A good measure is competition, and by that score, I felt I certainly had a long way to go, as the Bristol Open back in August 2007 marked my sole fight so far. I thought it wasn't likely I would compete as a blue for a while, as I wanted to feel a whole lot more comfortable with the weight of that rank first. That was the wrong attitude, as it turned out: I waited so long I got promoted to purple belt before I had a chance to compete at blue, then lost motivation and interest in entering a tournament. While wandering around the web during mid-2008, I came across somebody called Roy Dean. He proved to have a very interesting site, especially his eBook, An Uchideshi Experience. I wrote how much I'd enjoyed his articles and YouTube videos in a few posts over April and May. To my surprise, that resulted in an email from Roy himself, which in turn led to my numerous reviews of his DVDs. I'd later get a chance to meet and train with the man himself, after being invited to his first UK seminar in Poole, which was an amazing experience. At the end of 2008, I had a lovely christmas present in the form of a redundancy from KPMG. In other words, I got bitten by the credit crunch. Still, it meant I could try out new things on the blog. I wrote lots more reviews (in particular, my immense Gracie Combatives review would have been difficult to write if I'd been working), and also started doing articles. A lot of new blogs began appearing, and I found that soon a vibrant community of bloggers had grown up around BJJ. It has been cool to 'meet' some awesome people through the internet, like Georgette, Leslie, Francisco, Julia, Megan and Seymour, among many others (eventually I made a long list of blogs). 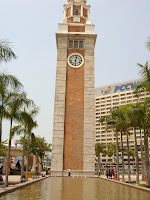 It also made me keener than ever to make a training trip to the US, though I didn't yet have the time and money. Another advantage of unemployment was that I had a chance to bounce around various clubs in the UK, due to job seeking: after no longer being able to afford the fees at RGA, I moved to the affiliate in Kilburn, where I could continue to train with Jude Samuel. It also meant that I could continue rolling with my favourite training partner from RGA HQ, Christina. At the time, I was also looking after my niece, in order to help my sister return to work. She lived near Clapham Junction, which was perfect for getting to Kilburn. However, a few months down the line she moved to Cobham in Surrey. The trains from there make getting to training awkward, so I had to look for a new option, eventually finding it at Nova Força in Epsom. I could cycle over there in about forty minutes, which wasn't too bad (and good fitness!) The only downside was that because I was bouncing up and down the country to see my girlfriend, who was then studying a Masters degree at Warwick Uni, I could only train once a week. Nova Força was also my first experience training BJJ outside of the RGA family. The black belt who runs it, Ricardo Da Silva, was one of the first instructors to teach BJJ in the UK, starting off at Sleeping Storm before it closed. Ricardo's classes fit my image of what a Carlson Gracie class might be like (I don't know much about the Nova Força team history, so perhaps there is a Carlson connection somewhere), with tough training and intense sparring, plus lots of belt whipping. After that, I headed back to Warwick Uni for the end of my gf's MA, when I trained at Combat Athletics in Canley. The area is decidedly unpleasant, but the training was pretty good, taught by a John Will affiliate, who was a blue belt when I was there. Classes were all nogi, mainly because most of the people training there had yet to buy a gi. From September 2009 to April 2010, I was back with RGA, at the affiliate in High Wycombe under brown belt Kev Capel. This proved to be the friendliest place I'd ever trained, because Kev is undoubtedly the most approachable instructor I've yet encountered. He's also around my size, which is always a help. I met a lot of great training partners too, especially Howard and Callum. Kev would prove to be a central figure in my BJJ journey. In April, I finally got a new job, necessitating a move to Leamington Spa. That meant training at Gracie Barra Birmingham, the place I'd originally meant to join way back in 2006. So, in a sense I'd come full circle. Like Kev's club, GB Brum was also really friendly, and like RGA HQ, there was a broad range of size, age, skill and a few women on the mat. I was particularly impressed by Norbi, who was not only a top notch instructor, but incredibly generous and welcoming. Definitely somewhere I would recommend. I left that job a few months later, just as GB Brum moved to a new city centre location. Returning home, I was back training at Kev's club in High Wycombe, later moving to his Aylesbury location. My eventual goal was to move down to Bristol, so I could live with my girlfriend. Handily, Nicolai 'Geeza' Holt opened up Gracie Barra Bristol in late 2010, so I took the opportunity to occasionally drop in while visiting my gf. As I had moved to paying £50 for a block of seven lessons rather than a monthly fee at High Wycombe, that made sense (especially as Geeza didn't charge much for the initial months after GB Bristol's opening). 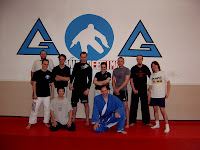 On 6th March 2011, Roger Gracie came up to do a seminar at RGA Bucks. I was one of seven people to get promoted to purple belt. It is a heavy belt, but while Roger is the one who tied it around my waist, he was of course acting on Kev's judgement. That meant I felt less nervous about it than I would have done if anybody else had given me the belt. I have a lot of respect for Kev, and he has also observed my game for a long time now, including numerous rolls with me. I knew I would not be completely comfortable with it for a long while, but then I felt the same way when I got my blue. In May 2011, we finally found a house, so I moved down to live with my girlfriend permanently. After a decade of having to bounce up and down the country to see each other, it was a huge relief to at last live in the same place. 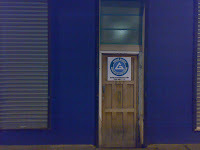 Even better, the house was right around the corner from Gracie Barra Bristol, which by this point had moved into the huge converted warehouse next to the temporary building I'd been to previously. While I was in the Peak District on my way to Factory BJJ, Geeza rang to see if I wanted to become an instructor at GB Bristol. I've always wanted to teach, so I jumped at the chance: I now had a reason to be happy about getting that purple belt, as otherwise I don't think I would have been asked. Beginning on 12th May 2011, I was in charge of the Thursday classes. Originally Miles, a fellow purple belt, was holding the fort on Tuesdays. However, due to his many responsibilities, most obviously a new baby, that responsibility was passed to a high level blue belt called Dónal, who I had first met up at Gracie Barra Birmingham. It was pretty cool of Geeza to trust me with the responsibility of running a class so soon after meeting me, including a set of keys to the club. He also left the details of the class almost entirely up to me, so I was faced with the enjoyable challenge of developing a curriculum. My intention was to build up a series of classes on each of the six basic positions I'd chosen (mount, side control, the back, closed guard, half guard and open guard), which I could continue to refine over the years. In July, my workload outside of class increased again, taking up a lot of my evenings. I was also spending a lot of time doing DIY on the house, which only started to calm down around October. BJJ was therefore not the priority, although as ever I still made sure to attend at least one class a week. My time was cut back even further once I started a full time job in January 2012. As a result, my schedule became training under Dónal (who got his long overdue purple belt in December 2011) on Tuesdays (due to the length: 1 hour is too short and 2 hours is too long, so 1.5 hours suits me perfectly) and teaching my class on Thursdays. By September 2012, Miles was ready to return to teaching, taking charge of Thursday nogi classes. That meant that my Thursday gi session moved over to Mat 2, where Gracie Barra Bristol had trained while waiting for the main building to be repurposed for jiu jitsu. It's a much smaller space, but then my classes weren't normally all that large anyway. Also in September, I organised a charity GrappleThon for Meningitis UK, which ended up raising over £3,000. Less good that month was a groin injury I somehow picked up, which severely hindered my ability to play guard or hold back mount. The community aspect of BJJ is something that has increasingly grown in importance for me. In November 2012, that culminated in a brilliant training trip to Texas. That gave me the chance to finally meet a number of my favourite BJJ people in person, having previously only known them online (e.g., Georgette, Jodi, John from Bullshido, Triin from Fenom and numerous others). The schedule at GB Bristol continued to change as 2013 rolled along, again due to children. Dónal became a father that year, resulting in his teaching load dropping to just Wednesday. I therefore took over Tuesday and returned to Mat 1, leaving Thursday dedicated to nogi. However, I still got in plenty of training with Dónal, as I began taking semi-regular private lessons with him in 2013. This fed directly into my lesson plans, which as I hoped in 2011 have enabled me to gradually refine a small set of techniques, with the eventual goal of not only being able to use them effectively in sparring, but also to teach them well. Another boost on that front arrived a few months later, when the 'study hall' class was added on Sundays (basically, an open mat with a focus on drilling, which is what I tend to do at open mats anyway). In May, I organised my second GrappleThon, which went even better than the first: we managed to raise over $13,000 this time, which is a brilliant amount. There was a lot of support from around the country, along with some big donations from outside the UK as well. To try and expand the concept, I set up GrappleThon.org. I'm hoping that will also help other people run their own GrappleThon events (to which end I wrote a guide, here). The Gracie Barra ethos can be quite stiff and formal when all the rules are strictly followed, as is the case at GB Bristol. I was able to mostly avoid that atmosphere as I narrowed down my attendance to the classes I taught, but towards the end of 2013, it became increasingly clear that I just wasn't a good fit with the GB environment. I decided the time had come for somebody to take my place on the teaching staff, somebody who could get fully on board with what the school owner was trying to build. After an amicable discussion, I handed back my keys in late October. That was made easier, at least for me, by the fact that since 2009, my belts have come from Kev Capel up at RGA Bucks. Although my purple belt was actually tied on by Roger Gracie (as the association head), Kev is the person who has been in charge of evaluating my level from 2009 onwards. I am still under Kev, regularly heading back to RGA Bucks in Aylesbury to train at his school, both in group classes and private lessons. I have trained with many excellent instructors over the years who I can happily recommend, but Kev stands out both in terms of his character and teaching ability. Hence why I have never sought rank under anybody else, even though it became a long distance instructor/student relationship when I moved to Bristol. I continued teaching and training at Hit Fit with Dónal, where he had started teaching a little while before I left GB Bristol. As Hit Fit only offered one class a week at the time, a number of which I ended up teaching after agreeing to help out when Dónal wasn't there, I had a relaxed November and December. In late 2013, Dónal and I began considering the possibility of starting our own club, after the opportunity came up at a central venue in Bristol. It made sense for me, as I already had a well-established instructor/student relationship with Kev. By starting my own school, I could easily maintain that connection, remaining affiliated to Kev as an individual but not as a club (having discussed it with him, we were both happy with the situation). It also meant I could put into practice the numerous ideas I had about how a school could be run. After a couple of months going back and forth on various options, we eventually decided on the name 'Artemis BJJ'. The plans Dónal and I had been making came to fruition on the 27th January 2014, with the first official class under our Artemis BJJ banner at Bristol Sports Centre. Shortly afterwards I had the Artemis BJJ website up and running, along with various bits of social media (Twitter, Facebook and Instagram). A few months later in April, I organised my third GrappleThon, raising over £5,000 for local charity Kinergy. The very next weekend, I did something else for the third time: fly to the USA. I made some new friends in Virginia, meeting up with several people I've interacted with for a long time online, like BJJ Grrl. Next up was a return visit to the fabulous Georgette in Austin, before flying onwards to Florida for yet more awesome blogger encounters. I also took the opportunity to get in some interviews with all these fascinating people, which I've been gradually posting up in a 'Blog Chat' series on this website and others, as well as the odd magazine piece. Not long after my return from the USA, we opened up at a second venue. With two Artemis BJJ locations in Bristol, Dónal and I split the teaching. Dónal took charge of classes at the other place, while I was responsible for the sessions at Bristol Sports Centre. We both still tried to support each others classes by attending, as well as covering when the other was on holiday. Artemis BJJ has been fortunate in that there are a number of brilliant senior students willing to help out if for some reason both Dónal and I need to be away: the Bromleys and Chris J have both generously stepped up several times now. Most exciting of all for me is that I finally got a long-term women's class off the ground (or as this is BJJ, should that be on the ground? ;D). I've attempted it twice before, but in late July 2014, I secured a venue (Bristol Sports Centre again) and some funding, giving the session a real chance to grow over the space of four months, at no charge to the students. After that, we'll hopefully have a core group of students turning up regularly, who are also willing to pay enough to cover the rent. Until then, it's completely free! Our first class had a great turn-out of ten women (my girlfriend is behind the camera in the below pic). Awesome! The turn-out for the women's class has fluctuated between three to ten women, with a core group of regulars. In August I had a very memorable weekend in Congleton, involving a lot of cycling, a new tattoo on my foot and Jodie's GrappleThon. During October, Dónal stepped back from the club due to his family commitments, though he still popped down to train occasionally. That meant I was responsible for all the classes, five times a week. Although that was a significant jump in my teaching load, it came at a good time, as I was looking to move to part-time at my office job. I was especially excited that we were able to start a two hour Saturday open mat that month, over at PHNX Fitness in Kingswood. In November, my senior student Chris wasn't able to attend the evening classes, so we started meeting up during the day for some training. This proved incredibly useful to me, as I could really focus in on improving my guard, which has languished for a long time now. Unfortunately my old groin injury flared up in December, but I was able to train around it, focusing on the useful 'arm shield' concepts from Ryan Hall's The Defensive Guard. Meanwhile, classes at PHNX never grew beyond one or two regulars (there's nothing wrong with the venue, but for whatever reason it wasn't attracting BJJ students. I think the location was the main problem), so I made the decision in May to move all the classes over to MYGYM Bristol (shifting the Thursday to Friday and the Saturday open mat to Sunday). It turned out to be a good choice, as by the end of June, membership had pretty much doubled. July 2015 marked the first time Artemis BJJ students entered a competition, with Kirsty, Steve and Ross all bravely taking the plunge. In preparation for Roll Models on the 5th July, I instituted a 'comp prep' drill, learned from my visit to Rob Taylor over in Swansea. The idea is that you have two people 'competing', two other people coaching them, a referee and somebody noting the points. It's a great way to get used to the tournament environment, plus it gave me an excellent opportunity to develop my ability to coach. It also marked the first medal for the team, with Kirsty securing a bronze medal. Our next two outings, both at the highly regarded Hereford Open, didn't bring any trinkets, but it did give the team lots of experience. That paid off by the time we attended the Bristol Open in February 2016, with lots of people competing and loads of medals. Simon L won gold (entering on a whim, which makes it even more impressive), Sam fought to a hard earned silver, while Ross, Paul and Rich all gained a bronze. 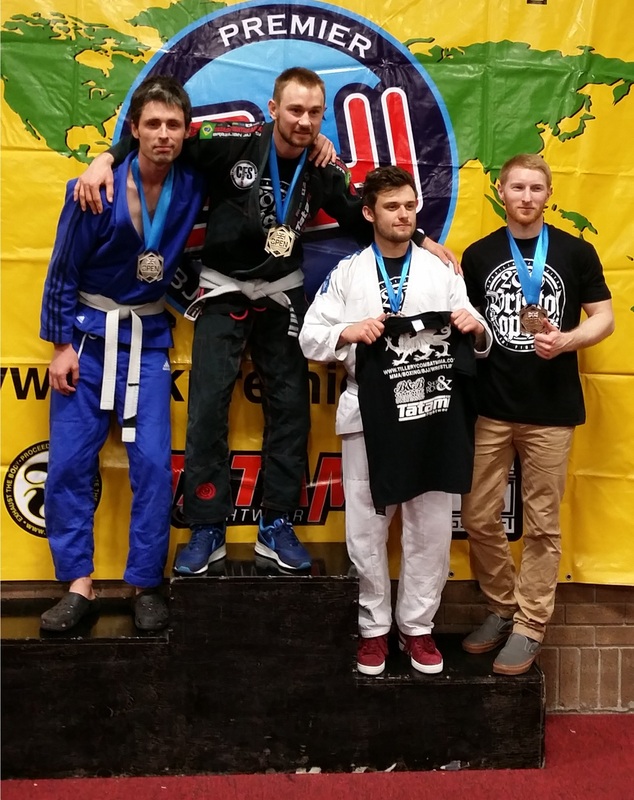 In March, it was time for the fifth GrappleThon I've organised and the second hosted under the Artemis BJJ. We went for another local charity, One25, who are so local that you can walk to their office from MYGYM in about ten minutes. The grand total was just over £5,000, helped by the fact that this time round, there is a second leg of the GrappleThon. That's because GrappleThon stalwart Mike Cowling decided to hold a GrappleThon at his school in London a couple of weeks after he came to our event in Bristol. Awesome! I went to another two BJJ Globetrotter camps in June and July, adding to the day I'd spent at the inaugural Leuven camp the previous year. Although I again only spent a day at the July Bournemouth camp, I was there for the full Leuven 2016 experience. All that training had a big impact, not the least of which was the copious amounts of useful teaching material it provided. I also took the opportunity to take several private lessons from three of the black belts at the camp. This started a process where I aimed to get to at least one BJJ Globetrotter camp annually, preferably two. As ever, I make sure to write everything up when I go to a camp, which you can read here. We continued hosting various seminars at Artemis BJJ, which had begun with Chelsea Bainbridge-Donner in late 2015. By 2017, she had graced our mats four times, together with her partner and fellow black belt, Tom Barlow. Seminars proved to be another benefit of the BJJ Globetrotter Camps, as several black belts I met there also resulted in seminars back on the Bristol mats. Ana Yagues arrived shortly after Bournemouth 2016, while Chad Wright from the Leuven camp put me in touch with his instructor Neil Owen. He taught a fantastic seminar in January 2017, returning in March. At the tail end of 2016, I launched the Artemis BJJ Podcast, beginning with various audio I had from the numerous interviews I've done over the years, along with new content. Chelsea and Tom provided my first 'new' audio, followed by Neil. By February 2017, Artemis BJJ had been running for three years and I'd achieved one of my major goals. 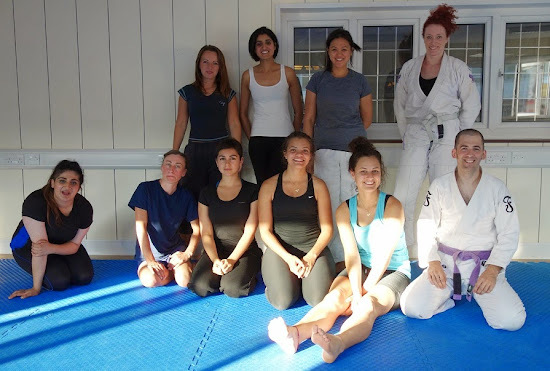 The Artemis BJJ women's class was almost three years old too, taught by me since July 2014. As much as enjoyed teaching that class, I really wanted it to be a truly women-only lesson, meaning a female instructor. She arrived in the form of Lisa in 2017, a blue belt who had first been to Artemis BJJ as part of the 2015 GrappleThon. Lisa took charge of the women's class, helped by some of the experienced female students (such as Kirsty W) when she's away. To help relaunch, Lisa set up an introductory BJJ course for women on the 1st March, running for five weeks. We held another successful GrappleThon in May, then in June, Artemis BJJ had it's first ever grading. That's all thanks to my awesome instructor Kev. Despite the club being unaffiliated, he very generously agreed to grade my students, which yet again shows what a great guy he is. I was incredibly proud to see 13 Artemis BJJ students get new belts, including Chris (finally!) receiving his purple. An especially emotional moment for me was seeing three women getting their blue belts, all of whom started in the women's class. More seminars and more BJJ Globetrotter Camps followed in 2017, along with more competitions. The school grew to a healthy size, helped by the usual annual spike around October/November. By our Winter Grading, the second with Kev, we had around fifty regular students. That grading resulted in the school feeling like it had reached a certain level of maturity, as along with several more blue belts, Kev also promoted three new purple belts. There is a full BJJ rank list on the website, if you're curious. I was especially proud of Tracey earning her blue belt, as I know just how much she's had to overcome to reach that point. Even more impressive is that she also competed for the first time the previous weekend, despite some longstanding injuries that would have led many other people to rule out training at all, let alone competing. Kev promoted me to brown belt at the same grading, which is good news for the club. Those aforementioned daytime open mats gradually shifted into longer sessions, starting with a structured bit of teaching before the open mat. This has been wonderful for me, as it means I get to practice classes I then teach later in the evening. It has also led to more of that helpful (if tough!) sparring with guys like Sam. As my teaching load has become greater, forcing myself to get those hard rolls in has been harder. Much easier to have a relaxed spar with somebody I know I can handle, but that's a dangerous trap to fall into. You need to roll with people less experienced, the same level and better than you: at a young club, it's all too tempting to stick with those easier rolls, as there are few hard rolls available (purely down to time, because less higher belts). Towards the end of 2017, we were at the stage of averaging classes of over 20 people in the main Monday and Wednesday sessions. My spreadsheet had a target of 60 people signed up before I could go full time with the club. We reached that target around August 2018, meaning that after giving in my notice at my office job, I became a full time BJJ instructor and club owner on the 9th October 2018. It's a big moment, as income is no longer a steady paycheck: exciting and scary at the same time! [If anyone reached this page by Googling "warwick uni bjj", "warwick university bjj", "warwick brazilian jiu jitsu", "warwick bjj" or something like that, then you may be in luck. I started a BJJ training group at Warwick Uni, which is now mostly run by members of the judo club: see Facebook for more details. hi bro! i just started a blog similar to your to track my bjj progress as well. i hope you get to visit it so that we could exchange notes about techniques and stuff. i have been reading your blog for quite some time now and you have pretty good stuff here. my blog is groundboxer.blogspot.com.